Hi guys! I'm writing this post to tell you about my experience on the By The Glass Show a few weeks ago and to share my recipe for apple and goat cheese tartlets. So, on July 5th I was an in studio guest on the By The Glass show. 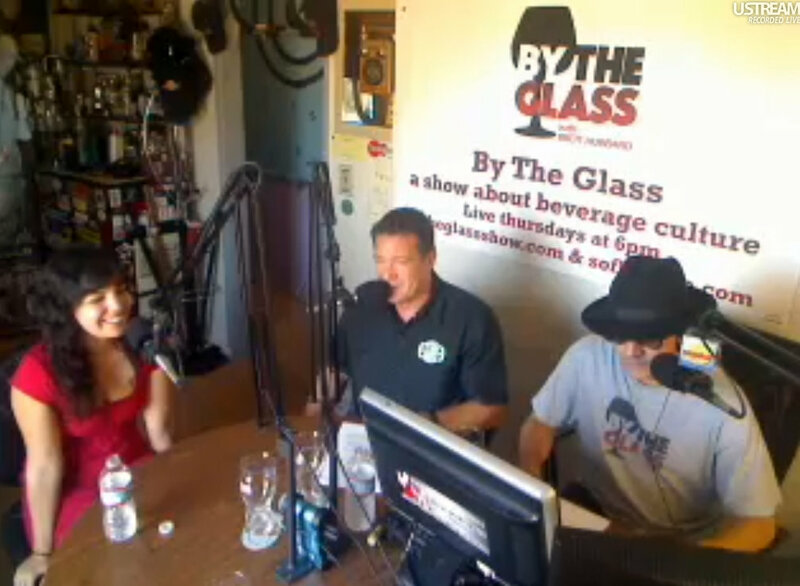 By The Glass is a really cool radio show about adult beverages. They talk about all types of drinks: sake, rum, beer, wine, mead, you name it. And they have some really interesting guests. You can watch or listen live Thursdays at 6, or you can see old shows once they are uploaded. "And this is what real beer can do: it can make every single decent meal that you have an interesting and memorable flavor experience. It can be something that will light up your senses and make you actually want to pay attention to what's happening on your palate. Paying that little bit of attention, both to your food and to your beer, is the difference between having an 'OK' culinary life and having one filled with boundless riches of flavor. Learn a little bit about the amazing variety and complexity of flavor that traditional beer brings to the table and in return I promise you a better life." More recently, he put together The Oxford Companion to Beer, covering almost everything you would ever want to know about beer. Garrett is pretty much as big as it gets in the beer world and is an amazing speaker. I was thrilled to get to be on the show when he called in. 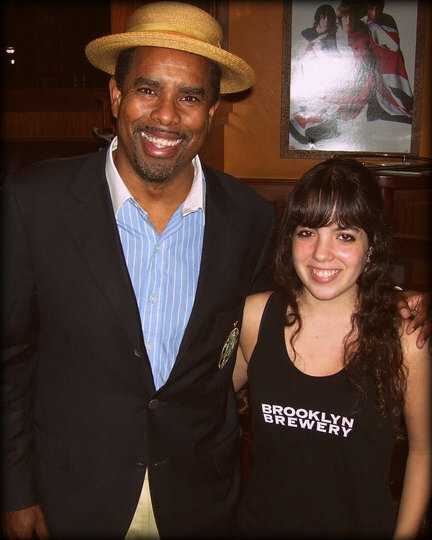 Here is a picture from when I met him in person in 2010 after he spoke at a Total Wine event. So here is a review of the beers we tasted and the dishes I made. All these dishes can be made ahead of time and served at room temperature. First up, Brooklyn Lager. For this beer I made two kinds of bruschetta: one topped with tomato and basil (recipe here), and one topped with marinated eggplant (recipe). Both were delicious and a big hit. I especially liked the eggplant and lager pairing. I've actually paired a similar eggplant dish with another beer we tasted that day, Sorachi Ace. So for this one, I changed some of the herbs that I used and it really complemented the lager. The caramel malts were a nice match to the toasted bread, garlic, and eggplant. The tomatoes were also delicious with the lager. The balsamic vinegar, basil, and tomato combo. Yum. The second beer we tasted was Sorachi Ace. I love Sorachi Ace. I've used it as a pairing quite a few times before. It's citrusy, spicy, super interesting, and works well with a variety of dishes. (Once I paired it with crab cakes and it was delicious!) I decided to do both a sweet pairing and a savory pairing because I couldn't settle on just one thing. First I made a ceviche. It was a Peruvian style ceviche but with some pineapple and some other extra stuff added in. It was amazing with the beer. Both are so bright and citrusy, and the cilantro was just perfect with the beer! Then, the main attraction of this post, the apple and goat cheese tartlets. These paired beautifully with the Sorachi Ace. I knew this beer was good with goat cheese so I wanted to use it in my dessert. I decided to cook the apples in the Sorachi Ace along with some sugar and spices. The thyme was lovely along with the goat cheese and puff pastry and beer. Not gonna lie, I think this was a flawless pairing. These flavors were just meant to be together, and bringing the Sorachi Ace in as an ingredient really brought it all together. Garrett Oliver actually has a recipe for a goat cheese and apple omelette on the Brooklyn Brewery website that he pairs with Sorachi Ace, which sounds amazing! And lastly, with the Brooklyn Black Chocolate Stout I did a take on my chocolate mousse with raspberries. Here's my recipe. Deep rich chocolate with a deep rich chocolatey stout. Can't go wrong, and the raspberries add an excellent contrast. I had a lot of fun on the show, even though I was pretty nervous at first. The guys were really awesome and welcoming. Their next episode is this Thursday and is about craft beer cocktails, which is something I would actually love to start experimenting with. You can watch the episode I was on here. Apples - Melt butter over low heat in a medium sauce pan. Add chopped apples to the pan. Let cook for 5 minutes. Add the beer, sugar, thyme, and spices. Simmer for 20 minutes. Puff Pastry -Lay out the puff pastry sheet on a lightly floured surface. Using a cookie cutter or a small cup, cut out circles from the dough. Place them on a greased baking sheet (I used butter). Bake at 400 degrees for 15 minutes. Once the puff pastry is cooked, take each one and just pull the bottom and top apart a little and it should separate easily. Then you can make a little sandwich. Place some goat cheese on the bottom half and top with some apples. Sprinkle with a little extra thyme and top with the other piece of puff pastry.